Glaucoma causes more vision loss in aging adults than almost any other eye disease, and it’s quite common in seniors over the age of 60. Family caregivers with an elderly relative who has glaucoma should learn as much as they can about the disease, so they can provide better support and assist in the treatments. While there’s no cure for glaucoma, the progress of the disease can be significantly delayed with proper treatment and overall awareness of eye health and wellness. 1. Glaucoma describes damage to the optic nerve due to eye pressure. Within each eye is a bundle of nerves that transmit visual signals to the brain. This bundle is known as the optic nerve. The eye is also filled with fluid, and normally this maintains a neutral balance where pressure is concerned. However, with glaucoma, the eye fails to drain, and the pressure builds. This pressure causes damage to the optic nerve, which can lead to permanent blindness. 2. Early stages of glaucoma has no noticeable symptoms. In the early stages of the disease, most people don’t notice any symptoms. It’s only when the glaucoma has progressed do seniors notice symptoms like blurry vision, seeing double, sensitivity to light, headaches, and tunnel vision. An eye doctor can detect early stages of glaucoma via a series of tests during a regular eye exam, so it’s critical for family caregivers to bring their aging loved one in for an eye exam. 3. Certain risk factors exist for those more likely to develop glaucoma. 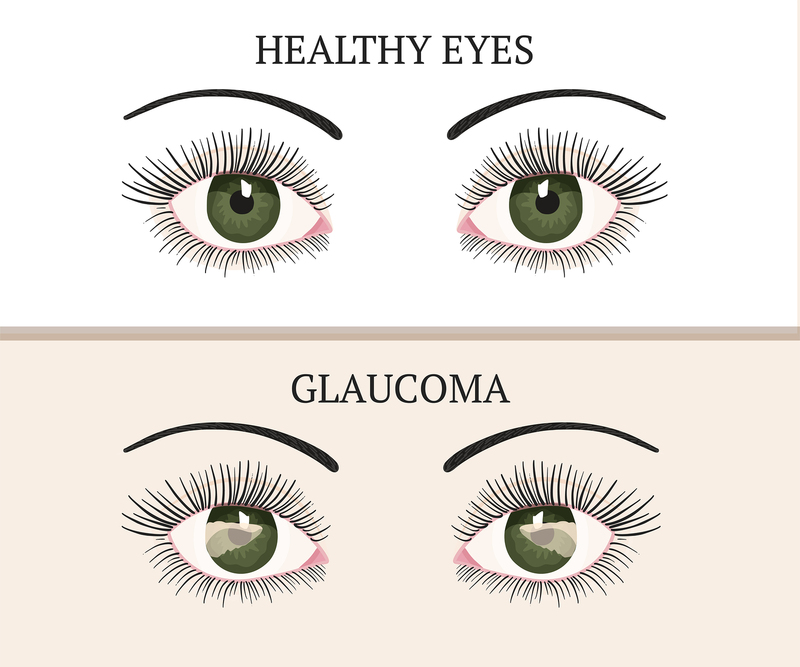 While glaucoma can develop in just about anyone, there are certain factors that contribute to a higher risk factor. Age is a big deal with glaucoma development, with seniors over the age of 60 at the highest risk. Other risk factors include an African-American, Hispanic or Asian heritage. Seniors with untreated high blood pressure and diabetes are also at risk. 4. Successful treatment requires diligence. To treat glaucoma, the eye doctor will prescribe medicated eye drops that will help control the pressure in the eyes. These drops should be taken regularly, so family caregivers and home care providers must be vigilant in reminding seniors about when to take them. Other treatment options include laser surgery to help relieve pressure. Doctors will also recommend some lifestyle changes like increased activity and exercise, healthy eating and controlling other health issues such as diabetes. 5. Regular eye exams are essential to diagnosis and treatment. More than anything, regular eye exams are the key to either diagnosing glaucoma in the first place or slowing down the progress of the disease. If the aging adult hasn’t had an eye exam in a while, family caregivers should schedule one right away. After that, the doctor can recommend the frequency, from every 3 months for those with glaucoma to ever 6 or 12 months for those who don’t. Frequent communication with the eye doctor is the best way for aging adults to deal with the causes and treatments of glaucoma. If you or an aging loved-one are considering Home Care Services in Poway, CA, please contact the caring staff at GoldenCare today. Call us at 760-828-5201.